This is a rendition of Korean soondubu (tofu soup). The main ingredient is tofu and the consistency should be like a chunky soup or stew. 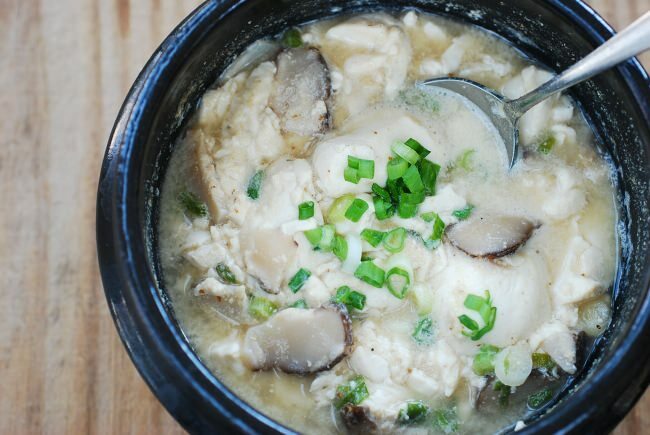 This recipe is inspired by this Korean Soondubu Jigae recipe. Vegetables of choice. Suggested: mushroom, spinach/kale, white radish (daikon) or baby bamboo shoots (takenoko). Adding 1-2 vegetables is best - keep it simple. Make the dashi broth and bring to a boil. Add garlic (minced or grated works). Add soy sauce and vegetables. When the stew is almost cooked, you can crack an egg over the top. Alternatively, you can serve this with a boiled egg. This miso soup is a great simple and quick side dish that goes well with rice or a side of vegetables. This is also great as a quick lunch. Prepare miso soup (miso shiru) how you would normally prepare it. In a separate pot, boil somen until al dente. Add somen to miso soup. You can add small cubes of soft tofu, seaweed (wakame), or fried (aburaage) tofu if you like.